To set the following sections on Paleogene birds into a full context, the Mesozoic fossil record of Neornithes is briefly outlined in this chapter. In-depth information on Mesozoic nonneornithine birds can be found in Chiappe and Witmer (2002) and Chiappe (2007). Hope (2002) reviewed the Mesozoic fossil record of putative Neornithes and listed the described taxa; a similar table was published in Dyke (2001a). All of the specimens that were considered correctly identified by Hope (2002) are from late Cretaceous deposits, mainly from the Maastrichtian of the North American Lance Formation. They were assigned to stem group Galliformes (Palintropus), the anseriform Presbyornithidae, ?Charadriiformes (Graculavus, Cimolopteryx, Volgavis), Gaviiformes (Neogaeornis, Polarornis), ?Procellariiformes (Lonchodytes), Pelecaniformes (Torotix and unnamed species, which were identified as representatives of the Phalacrocoracidae), Psittaciformes, and Neornithes incertae sedis [Ceramornis, Elopteryx, Iaceornis ("Apatornis")]. Most of these taxa are based on very fragmentary remains, and none can be unambiguously identified. The taxon Palintropus, for example, is only known from a scapula and omal extremities of the coracoid, and was tentatively assigned to the galliform Quercymegapodiidae (see Sect. 6.1.4) by Hope (2002). However, Palintropus can at best be the sister taxon of all other Galliformes, because the coracoid exhibits a foramen for the supracoracoideus nerve (see Fig. 15.3 in Hope 2002), a plesiomorphic feature, which is invariably absent in Cenozoic and extant galliform birds including the Quercymegapodiidae (see p. 353 in Hope 2002). Longrich (2009) described further material of Palintropus from the late Cretaceous (Campanian) of Canada, and questioned its neornithine affinities. Dyke and Mayr (1999) detailed that assignment of a fragmentary mandible from the late Cretaceous of the Lance Formation to the Psittaciformes (Stidham 1998) is far from convincing, and even neornithine affinities of the specimen cannot be reliably established. Hope (2002) retained this fossil in the Psittaciformes, noting that the presence of a fused mandibular symphysis supports its assignment to Neornithes. However, this feature also occurs in the edentulous oviraptorosaurs (Elzanowski 1999), and it is well possible that the Lance Formation mandible comes from a representative of the Caenagnathidae, a North American taxon of the Oviraptorosauria. Hope's (2002) discussion of the phylogenetic affinities of Apatornis celer Marsh, 1873 was based on skeletal remains, which because of a lack of overlap of skeletal elements with the A. celer holotype were assigned to the new species Iaceornis marshi by Clarke (2004). Hope (2002) classified these specimens as Neornithes incertae sedis, but discussed a possible sister group relationship to the Anseriformes. By contrast, an analysis by Clarke (2004) supported the position of I. marshi outside crown group Neornithes, although the character evidence for either placement is still weak (see p. 149 in Clarke 2004). The fossil material of the putative gaviiform Polarornis gregorii Chatterjee, 2002 from the late Cretaceous López de Bertodano Formation of Seymour Island (Antarctica) consists of a partial skeleton, including the proximal part of the bill and the rostral portion of the cranium, parts of the otic region, a few vertebrae, a small sternum fragment, femora, and a proximal tibiotarsus. Despite this very fragmentary representation, detailed reconstructions of the entire skull and skeleton were published in the original description (Chatterjee 2002; see also Mayr 2004b). This presumably led Hope (2002) to erroneously state that P. gregorii is based on a "relatively complete skeleton"; Dyke and van Tuinen (2004, p. 160) likewise mistakenly assumed that the skull of this species is largely complete. The other putative late Cretaceous gaviiform, Neogaeornis wetzeli Lambrecht, 1929, is known from a tarsometatarsus from the Quiriquina Formation of Chile (Olson 1992a). N. wetzeli is a smaller species than P. gregorii, but because the tarsometatarsus of the latter is unknown, the affinities between these species cannot be established with confidence. Identification of neither Polarornis nor Neogaeornis can be considered unambiguous. However, the presence of well-developed, proximally protruding cnemial crests on the tibiotarsus of Polarornis indicates that this taxon had a foot-propelled aquatic locomotion, and was thus certainly not a stem group representative of the Spheniscidae (contra Feduccia 1999, p. 403). Chatterjee et al. (2006) briefly commented on a second, smaller and more gracile species of Polarornis from the late Cretaceous of Vega Island in Antarctica that awaits formal description. Not included in Hope's (2002) survey were the birds from the late Cretaceous or early Paleocene Hornerstown Formation of New Jersey (Olson and Parris 1987; Parris and Hope 2002). Most of these were assigned to the "form-family" Graculavidae by Olson and Parris (1987), which was regarded a "convenient catchall, intended as such" by Olson (1999a, p. 125). The species from the New Jersey deposits originally included in the "Graculavidae" by Olson and Parris (1987) are Graculavus velox Marsh, 1872, Palaeotringa littoralis Marsh, 1870, P vagans Marsh, 1872, Telmatornis priscus Marsh, 1870 (which also occurs in the unambiguously late Cretaceous Navesink Formation), Anatalavis ("Telmatornis") rex (Shufeld, 1915), and Laornis edvardsianus Marsh, 1870. Although Olson and Parris (1987) already considered it likely that the "Graculavidae" constitute a polyphyletic assemblage, "graculavids" found their way into the literature as "transitional shorebirds" (Feduccia 1999). However, A. rex was meanwhile referred to the Anseriformes by Olson (1999; Sect. 6.4.2), and Olson (1985) and Olson and Parris (1987) showed that the other New Jersey taxa of the "Graculavidae" are very similar to the Presbyornithidae, which are now also regarded as anseriform birds (Sect. 6.4.3). The resemblances to presbyorni-thids are especially strong in the case of Graculavus velox, which is known from a proximal humerus (see Fig. 4 in Olson and Parris 1987). Another species of Graculavus, G. augustus, was described by Hope (1999) from the late Cretaceous Lance Formation, and is also only represented by the proximal end of a humerus. This species is larger than G. velox, but otherwise is morphologically very similar. Likewise, the holotype and only known specimen of the large Laornis edvard-sianus, a distal tibiotarsus, was likened to the Presbyornithidae by Olson and Parris (1987). Because of its large size and similar overall morphology, it also needs to be compared in detail with the Pelagornithidae (Sect. 6.5). Novacaesareala hungerfordi Parris and Hope, 2002 from the Hornerstown Formation is based on the distal end of a humerus and associated wing fragments. The phylogenetic affinities of this species were considered uncertain by Parris and Hope (2002), who noted, however, that it resembles extant "Pelecaniformes" in the very short flexor process of the humerus. Compared with other Cretaceous taxa, and as detailed by Parris and Hope (2002), N. hungerfordi most closely resembles Torotix clemensi Brodkorb, 1963 from the Lance Formation, which is known from a distal humerus and was classified into the "Pelecaniformes" by Hope (2002). Other taxa from the Hornerstown Formation were tentatively assigned to the palaeognathous Lithornithidae (Parris and Hope 2002; unnamed species; see Sect. 5.1) and to the Procellariiformes (Olson and Parris 1987; Tytthostonyx glauconiticus Olson and Parris 1987; see Sect. 7.5). Also omitted from Hope's (2002) survey was Gargantuavis philoinos Buffetaut and Le Loeuff, 1998 from the late Cretaceous of France that was described as "a bird with an advanced synsacrum, possibly as large as a modern cassowary or ostrich" (see p. 110 in Buffetaut et al. 1995). The published material assigned to this species consists of a synsacrum and a referred femur (Buffetaut and Le Loeuff 1998), the morphology of both being very different from that of neornithine birds. The locality also yielded remains of very large azhdarchid pterosaurs, whose femur and pelvis are still unknown (Buffetaut 2001). Trevor Worthy (personal communication) considers a possible pterosaurian identity of Gargantuavis, which would be in line with the cranially positioned acetabular foramen. In any case, the wide pelvis of Gargantuavis is very unlike the narrow one typically found in large groundbirds (ratites, Gastornithidae, Phorusrhacidae). Since Hope's (2002) account, a few additional Mesozoic birds with a neorni-thine morphology have been reported. The fragmentary wing bones of Limenavis patagonica Clarke and Chiappe, 2001 from the late Cretaceous of Patagonia (Argentina) are of essentially modern appearance, but the species was assumed to be outside crown group Neornithes by Clarke and Chiappe (2001). Owing to the very fragmentary nature of the material, the affinities of this bird are best regarded uncertain. Clarke (2004) hypothesized that the incomplete distal tarsometatarsus that formed the holotype of "Ichthyornis" lentus Marsh, 1877 is from a galliform bird, and assigned it to the new taxon Austinornis. Possible affinities to the galliform-like Palintropus (see above) thus need to be taken into consideration. A fragmentary skeleton from the late Cretaceous Lopez de Bertodano Formation of Vega Island (Antarctica) which was assigned to the Presbyornithidae by Noriega and Tambussi (1995) was described as Vegavis iaai by Clarke et al. (2005b). The analysis of these authors supported a position of V. iaai within a clade including the Presbyornithidae and Anatidae. Although Clarke et al. 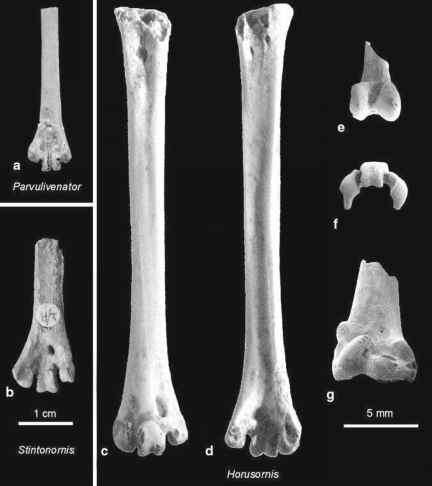 (2005b) noted differences to Presbyornis in limb proportions, close comparisons with the above-mentioned New Jersey fossils still have to be undertaken. Also from the late Cretaceous of Vega Island, Case et al. (2006) reported a femur of a large and putatively cursorial bird. Agnolin et al. (2006) described an incomplete, odd-looking coracoid from the late Cretaceous of Patagonia, which they considered to be from a neornithine bird. This specimen comes from a quail-sized species and its position within Neornithes has not yet been convincingly established. In summary, the late Cretaceous fossil record of neornithine birds is still poor and includes many fragmentary specimens of uncertain phylogenetic affinities. If Vegavis, Austinornis, and Palintropus indeed belong to the Galloanseres, they imply the existence of at least stem lineage representatives of palaeognathous birds and Neoaves by the late Cretaceous (Clarke et al. 2005b). The earliest unambiguous records of virtually all neoavian taxa stem from Paleogene deposits, so much the more so as the age of the Hornerstown Formation, where the putative procellarii-form Tytthostonyx comes from, is uncertain. Given the fact that the Paleocene fossil record already includes such morphologically disparate taxa as Sphenisciformes (penguins) and Strigiformes (owls), there can, however, be little doubt that stem lineage representatives of some taxa of crown group Neoaves were already in existence in the late Cretaceous. Such an assumption has received further support from the recent discovery of as yet undescribed sphenisciform-like fossils from the latest Cretaceous (about 65 Ma) of Chatham Island (Hansford 2008). Molecular clock data also consistently support a diversification of neoavian higher-level taxa in the late or even middle Cretaceous (Cooper and Penny 1997; Paton et al. 2002; van Tuinen and Dyke 2004; Pereira and Baker 2006a, b; Crowe et al. 2006; Baker et al. 2007; Brown et al. 2008). Much more controversial is the exact degree of the Mesozoic radiation of crown group Neornithes, i.e., whether there already was a late Cretaceous diversification of crown group representatives of extant "orders" or even "families," as suggested by many molecular analyses (van Tuinen et al. 2006; Baker et al. 2007; Brown et al. 2008). The literature on this subject is quite extensive, and it is beyond the scope of the present work to give a full account of it. However, molecular studies not only face problems with the lack or inadequacy of calibration errors and with heterogeneous nucleotide substitution rates (Graur and Martin 2004; van Tuinen et al. 2006; see also Heads 2005), but also with the correct identification of fossil taxa used for calibration of the molecular clocks. This is true, for example, for several molecular studies which yielded a Cretaceous divergence age of crown group Galliformes, with calibration points based on misidentified fossil taxa (van Tuinen and Dyke 2004; Pereira and Baker 2006a, b; Crowe et al. 2006; for a critique see Mayr and Weidig 2004; Mayr 2008d). It has been assumed that this discrepancy between molecular and fossil data may in part be due to the fact that early stem group representatives of extant taxa are difficult to recognize as such in the fossil record (van Tuinen et al. 2006; Brown et al. 2008). This concern is at best appropriate to a certain phylogenetic level. If early stem group representatives of major neoavian clades had a plesiomorphic "Galloanseres-like" morphology in the late Cretaceous, their correct identification would be hardly possible on the basis of fragmentary material. A diversification of, for example, crown group Passeriformes (Ericson et al. 2003; Pereira and Baker 2006b) or Psittaciformes (Miyaki et al. 1998) in the late Cretaceous, however, implies the presence of modern-type passerines or parrots by that time. These would certainly be recognizable by their osteological features. On the basis of our current knowledge of the fossil record, a Cretaceous diversification of, for example, crown group Galliformes, Psittaciformes, and Passeriformes is a highly unlikely assumption, so much the more so as crown group representatives of these taxa do not even occur in the fairly well known early Paleogene fossil record (see also Rose 2006 concerning a similar controversy surrounding the mammalian fossil record). Finally it should be noted that although it is generally assumed that all nonneor-nithine birds became extinct at the Cretaceous-Paleogene boundary (Feduccia 1995, 2003; van Tuinen et al. 2006), the factual evidence for this hypothesis is rather weak, given the poor early Paleocene fossil record of birds. At least Qinornis paleocenica Xue, 1995 from the early Paleocene of China may represent a nonne-ornithine avian lineage, which survived the Cretaceous-Paleogene extinction events (Mayr 2007a). This species is known from a partial foot, and the incomplete fusion of the metatarsals is more reminiscent of the condition in Mesozoic taxa outside Neornithes than in juvenile neornithine birds (contra Xue 1995).